Note: This guest post was written by Michael Curtin. Michael is a blogger for the Northern New Jersey Chapter of UNA-USA, and he’ll be joining the School of Diplomacy as a student this coming Fall. His recent op-eds have addressed topics such as the role of women in development, support for UN peacekeeping, previewing the UN for 2014, recent polling on the US-UN relationship, and Malala Yousafzai’s speech. When it comes to writing about the United Nations, or a specific international matter, there are really no shortage of ideas. Personally, developing the topic is the most exciting part of blogging. Why? It’s a learning process. One can educate themselves on a broad array of international issues in the news before finally settling on a topic. How do I begin? The process of coming up with an idea takes a few days because I want to find the right issue currently before the global body. I want to write about an area receiving considerably more press than perhaps another matter before the U.N. For example, my recent blog for our website centered on the U.N. report on climate change. This story received considerable “play’ in the media – both good and bad. In this case I was presented with an opportunity to counter the negative commentary the U.N. report had received. This is where I can really immerse myself in U.N. advocacy. When writing your op-ed, remember you want to select a topic you are passionate about and then “run with it.” Your role is to be strong advocate for the position you are supporting. The climate change topic did not take me as long to develop as some others have in the past as this story generated front page headlines. Once an idea is in place, I am ready to tackle my research. I will begin scouring and reading some of the major market publications like The New York Times, Wall Street Journal and the Financial Times. Other newspapers that are must, in my opinion, are the Washington Post and the Los Angeles Times. One can review a certain number of articles from these publications before the paywall enters the equation. The web assists me in my research as well. 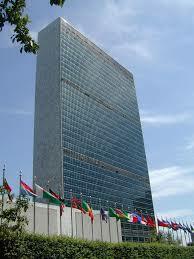 There are numerous quality U.N. websites that can be reviewed. As they certainly are utilized in academic research, journals can be a good source of information for op-eds as well. Bear this in mind: It is always important to begin your writing with some background on the issue. You want to educate and inform the reader, and hopefully persuade them to see your line of thinking; but do not assume the reader is keeping abreast of these issues. Here is an opportunity to engage a larger audience on important U.N. and international issues, so do not underestimate the importance of what you are doing. Once everything is in place, start putting pen to paper! Keep this thought in mind: My goal, and your goal as well, is to have your opinion pieces published in the nation’s major newspaper publications. There is no disputing this fact I am sure. However, to start, I would suggest to keep this thought in mind: “Think globally, publish locally.” The Chinese philosopher Lao-tzu said, “The journey of a thousand miles begins with a single step.” It is best to begin by submitting your pieces to local or community-based newspapers. I believe this increases your likelihood of having it published; then, take the next step and begin to submit to major market publications. I have utilized this strategy and have successfully have had several pieces published (see the above links) creating some very important exposure for U.N. issues and the work of the United Nations Association. You may want to read through the newspaper you are targeting for a few days to get a sense of what they have been writing about, and then perhaps write on that topic. Once you have submitted your writing, one tip would be to check the newspaper’s website periodically to see if it has been published. Ordinarily when it is posted to their website it will also appear in the print edition. If you do not have success initially, I would suggest to keep submitting. I would not be deterred from a first rejection. Often time newspapers have a generic email address to send to, but I would advise sending directly to the Editorial Page Editor or someone with decision-making authority. You do not want your hard work ending up lost in some inbox. When submitting directly to someone at the publication, it allows you to begin cultivating some important relationships that can help you going forward. Over time, as you submit more and more opinion pieces, you not only increase your opportunity for having your work published, but your name becomes synonymous with the issues you are putting forth. You can now begin to establish a relationship with your readers.